A statement piece that celebrates the ultimate fan's enduring allegiance. 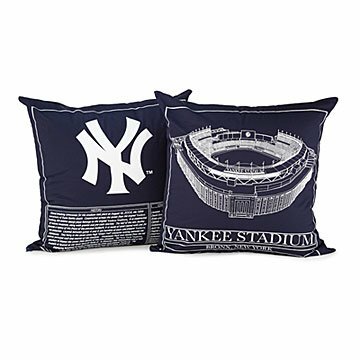 For the baseball fan who sees the world through team-colored glasses, this comfy pillow is a statement piece that celebrates their enduring allegiance. On one side is a beautifully detailed illustration that honors a stadium's unique history and architecture. On the other, its design specs and major events. Your ultimate fan will be reminded of cherished ballpark memories—and the ones yet to be created—every time they settle in to watch the big game. Printed in Brooklyn. Check out our Baseball Stadium Blueprints Team Colors here! Spot clean or Machine wash inside out, cold water. Hang to dry, iron on reverse side. It made a nice gift for our die hard Yankee fans brother and sister-in-law in laws. Used it for decoration and comfort. Very stylish and fun to watch the games with! It has all the history written right on the pillow. The picture of the stadium is great too! My cousin will love it! My cousin is retired and has had a couple of strokes so, unfortunately, he can't go to the games any more. So his sister and I do our best to keep him in team memorabilia.